Two weeks ago I headed up to Michigan, for what was an unplanned adventure into the wild forest and coastline surrounding Lake Superior. I was definitely hesitant about taking a whole week off from work, and not having a solid plan of what I was going to be doing most of the time. My goal heading into the week was to have a ton of fun, climb as much as possible (accomplish my 100 pitch per season goal), and meet some cool people. I started the trip off climbing with Mike, a friend from Kentucky who was spending a few weeks in Munising. Though, we really hadn't done much climbing together and didn't know each other a whole lot, we got a long and I felt like we had a good partnership on the rope. As I showed up to the cliff that Saturday, he handed me the rope and said "Do you want to lead it?". I had considered leading some low angle stuff but nothing really too vertical. The mantra with ice climbing on lead is don't fall. You have way too many sharp pointy things on you and then the quality of the ice also comes into play. Therefore, typically, people don't lead until they have 150+ pitches of ice in them (or at least this is a generally accepted rule of thumb). This was actually where my goal to do 100 pitches this season came from, because I wanted to be leading ice by next season, to tackle some bigger routes in the mountains... little did I know I'd start pushing my limits on this trip. I started trading leads with Mike, and my confidence and movement on the ice grew. There was one climb, where Mike got maybe 15-20 feet up on this climb, and he looks down to see his crampon had broken. I lowered him down and we were talking about how to finish the route and get the screws back. Mike responds, "Oh, you're going to lead the whole thing?" "Yep." I replied and tied into the end of the rope. I started up this 50 foot tall column of ice with a lot of confidence in my head. I made it up to the top and in Michigan fashion drove a few tool swings into the frozen dirt and moss at the top to finish topping out. I couldn't have been more psyched. It was a fantastic start to a great week ahead. The next day, Mike and I met up with two of his friends, Craig and Kate. Mike and Craig paired up and I paired up with Kate. Mike and I would set up a route, and then Craig and Kate would follow, we would switch routes, clean, and then repeat the process. While climbing at the East channel we were able to put up an impressive amount of climbs in a short amount of time. By 1pm when we stopped to eat lunch, it seemed everyone was exhausted. We got up a few more routes and headed back across the channel early, exhausted and happy. 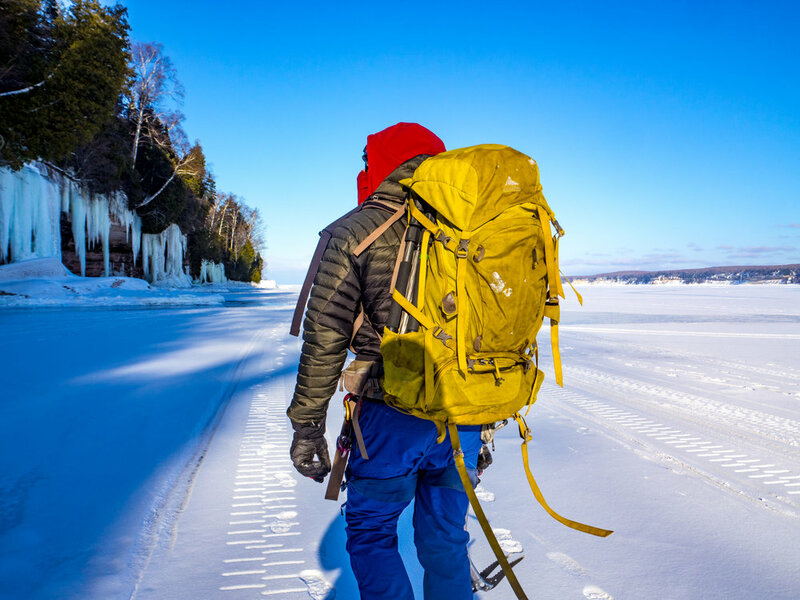 The next few days run together a little bit, but we ended up ticking off a ton of classic Munising Ice climbs. We climbed the Dryerhose, the Amphitheater, Bridalveil, School House and a bunch of other unnamed climbs. The trip out to Bridalveil falls was a particularly fantastic day. We ended up getting towed in by a snowmobile, and had to hike for a good 30-45 minutes along the shelf ice to reach the climbs. As Mike and Craig put up the routes on Bridalveil, I went to work and set up a couple other routes to play around on. In addition to the big ice flows, there was some big ice chunks where you could do some ice bouldering. I borrowed Kate's tools and tried my luck at climbing out of an overhanging bulge. Things were going pretty well, until a large chunk of ice came off sending me falling onto my back in the snow/ice below. Regardless, it was a ton of fun. On Friday, my friend Michael from North Carolina drove into town, which was really cool to see him and get back on the rope with him. I last climbed with him almost a year ago in balmy 60 degree temperatures at Table Rock. The first day we went out, we climbed Sweet Moses, a short slabby route we thought might be good, and then I got lowered into Dairyland, a massive 60+ meter WI5 climb. Getting lowered in I was terrified, because of the size, and the fact I didn't have leashes on my tools so they would have fallen all the way to the shelf ice. I think now, I want to go back to that climb next year, with leashes, and more confidence that I can really climb that without fear and do a couple laps on the classic. Friday night, professional climber Jesse Huey gave a presentation. He had a pair of tools to give away, but to make it interesting, he had a planking competition on stage during his speech, with the caveat you had to be in your underwear. Encouraged by my friends, I stripped down and hopped up on stage, immeditely wishing I hadn't skipped all those ab workouts. Thankfully, I wasn't the first one to drop out. I ended up planking for about 8-9 minutes, and the winner planked for somewhere around 15. I couldn't walk afterwards, it was rough. On the last day of climbing for the trip, Michael and I took a snowmobile ride over to Trout Bay. Trout Bay was incredible because of the amount of ice, the sheer size of it all and the seemingly infinite lines that were presented. After a full week of hard climbing everyday, I was spent and only led two climbs, and hopped on the rope of another party. Despite going on only three climbs that day, it was definitely a memorable one. I made the 11 hour journey back to Kentucky early the next morning. As I stepped out of the car in my driveway it was a bright and sunny 70 degrees; a stark contrast from the 12 degrees and snowy from when I left Michigan just 12 hours earlier. Over the course of the week I ended up climbing 50 pitches for a total of 107 on the year and completing my goal! I feel I really grew as an ice climber on this trip, really pushed my limits and learned to understand how the ice would break under you. . There is definitely something to be said for spending more time on the ice. The more time you spend on the ice the more comfortable you feel. I really enjoyed my time in the Upper Peninsula, and am already thinking about coming back next year.